Taken at the Perito Moreno Glacier in Los Glaciares National Park in Argentina on March 2, 2017. In early 2017 I was on assignment for Nikon, creating sample images for their brand-new 8-15 mm fisheye lens. While I was a little perplexed initially about how best to use the lens I soon uncovered some of its secrets in regards to landscape photography. One of the coolest things about the lens is it provides a 180° circular field of view at 8 mm. When zoomed to 15 mm the FOV is still nearly 180° corner-to-corner, meaning you get around 150° across the frame. For those not familiar with the technical details of photography, allow me to simplify: 150° across the frame is insanely wide. It’s so wide you have to struggle not to accidentally include your feet in the bottom of the photo when shooting vertically. It’s also so wide that it means you can shoot panoramic-style photos in a single frame. No stitching required, no panoramic ball heads, and no nodal point calculations. In this case it meant I could shoot this panoramic view of the extraordinarily massive and breathtaking Perito Moreno glacier in a single shot. For this particular photo I visited the glacier three separate times, mostly under gray and rainy skies. But on this day I finally got a break in the clouds, a little atmosphere, and a little nice light on the glacier itself. 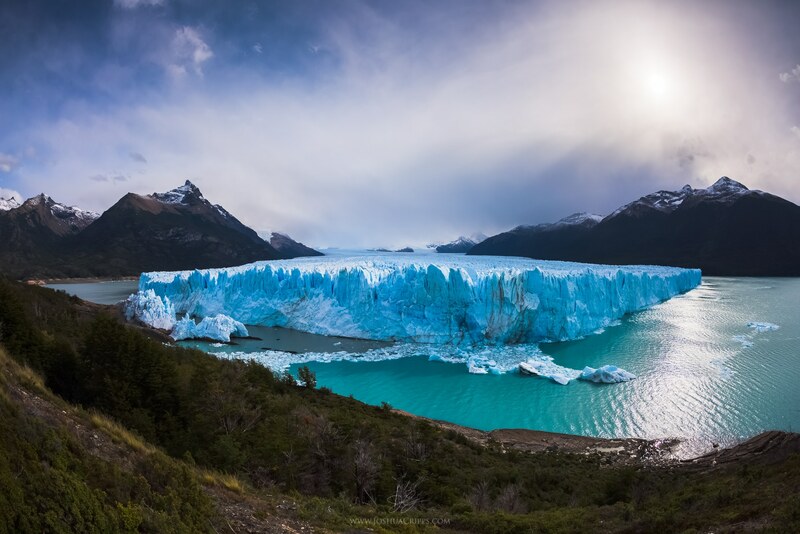 Perfect conditions to make a nice little pano shot of the glacier, or a Perito Moreno Petito Panino.